Put down whatever you're reading and pick up The Strange Case of Origami Yoda, the most delightful middle grade novel I've read in ages. 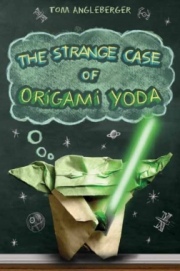 This case study, written from the perspective of a class of sixth graders, attempts to discover if Origami Yoda is real. The weirdest boy in school, Dwight, carries a small paper puppet and uses it to offer advice which solves the problems of his classmates--predicting a pop quiz, repairing a damaged reputation, and providing a variety of romantic guidance. Somehow the advice is always perfect, despite the fact that Dwight is completely clueless. Could this folded paper have mystical powers? It doesn't get more charming than this. The kids in the class face realistic issues, ones that I see playing out in my own sixth grade classroom each day, so readers will definitely relate. I felt a particular fondness for Dwight, the oddball who is so socially unaware that he can't help but alienate people. The characters are torn between their gut reactions to his strangeness and feeling guilty about how they treat him. This is so spot on. There are so many elements of the novel which will appeal to young readers. The pages are made to look crumpled, there are doodles in the margins, and each character has his own font. There are even directions to make an origami yoda. Add those fun touches to a sweet and funny story, and you get an instant favorite. I'll be recommending this to everyone. As part of the judging process for the Cybils, I read and loved Volume Eight of the Flight graphic novels. When I spotted the first volume of the series, adapted for younger readers, I knew I had to check it out. I love short stories and graphic novels, so Flight Explorer was perfect for me. Kazu Kibuishi rounded up a variety of illustrated stories that will appeal to readers who love fantasy, action, interesting settings, and fun characters. 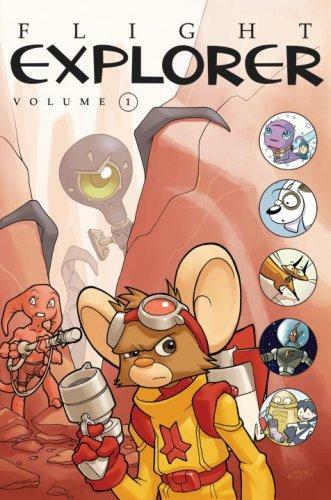 Many of the stories from this first volume have since become their own full-length graphic novels (Jellaby, Zita the Spacegirl, and Missile Mouse), so it often felt like visiting old friends. You may recall my affection for Kean Soo's Jellaby. In the most heartwarming story in the collection, Jellaby experiences his first snowfall and shares a sweet moment with Portia. I can't get enough of their friendship. I was also charmed by Phil Craven's story, "Big Mouth". The giant circular main character is enthusiastic and has a difficult time making friends, until he meets exactly the right one. This is the kind of story I want to keep at the ready for when one of my students is struggling to fit in. This story is simple enough for my ESOL students of varying levels to be able to add a few panels at any point in the story, changing the meaning or giving more examples of Big Mouth's quest. The range of stories in Flight Explorer makes it a worthwhile investment for classroom libraries. I have a list of readers that I know will enjoy it as much as I did. The Way a Door Closes is a perfect example of why novels in verse belong in our classroom libraries. At a slim 52 pages, it manages to meet many of my students' needs. 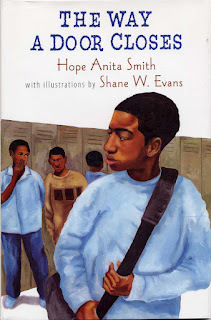 Its length is not intimidating to developing readers; if it weren't for the cover illustration of adolescent boys, it could be confused with a picture book. Throughout the book are moving illustrations by Shane W. Evans, which may assist readers who are struggling to paint mental pictures of the story. a father’s dream for his oldest son. words I wish someone had given him. Smith treats the father with more generosity than he may deserve and it manages to be refreshing. Not all fathers who leave are gone forever. The Way a Door Closes does not delve into what the father's return means, but the sequel Keeping the Night Watch does. The Way a Door Closes won the Coretta Scott King - John Steptoe New Talent Award and deserved it. I was touched by the struggles of CJ and his family, and hope that it can provide hope or solace for boys in similar situations. 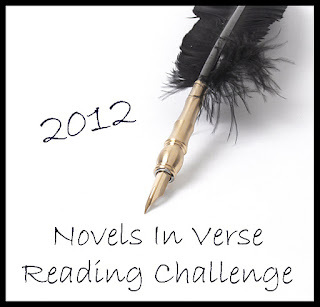 This is my first post for Born Bookish's Novels in Verse Reading Challenge. I've taken an interest in free verse novels recently and wanted to do something fun with them. I've decided to have a Free Verse Friday, featuring novels in verse. Amanda's challenge features three levels, with the highest being "Sonnet". I'm signing up to read 12 books, but know that I will read many more. You should sign up, too! Is it grand theft auto if it’s your daddy’s truck? Is it kidnapping if she’s your sister? Is it even wrong if you’re chasing your runaway mother? In The Map of Me, Margie never even pauses to ask these questions. As soon as she sees her mother’s note that says, “I have to go,” she grabs her annoying sister, Peep, her daddy’s keys, and hits the road. This wouldn’t be too shocking if Margie wasn’t twelve years old. Author Tami Lewis Brown has created two sisters who couldn’t be more different. Younger sister Peep is an overachiever: she skipped three grades, is perfect in the eyes of all adults, and needs to figure out all the angles before doing anything. Margie is the opposite, all bold actions and impulsive mistakes. Margie is tortured by her perceived flaws, flashing back to them throughout the novel. 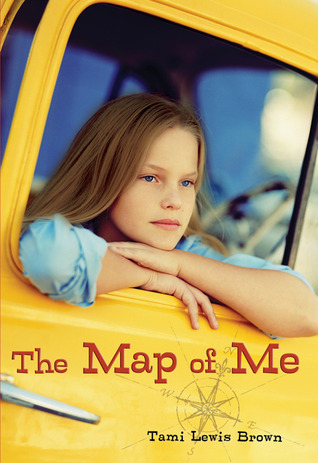 Although The Map of Me takes place in a stolen car, most of the story is internal. It may progress slowly for middle grade readers who want more action or a neater resolution. Instead, they get a character study of a girl who is determined to persevere and keep moving forward. Read this and more reviews at Young Adult Books Central. 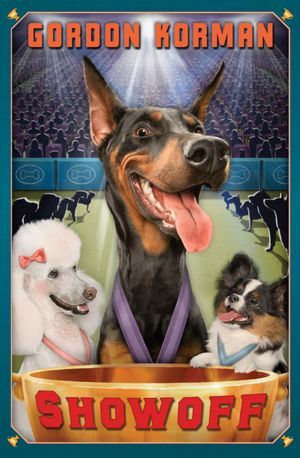 Gordon Korman’s Swindle team is back and they’ve gone to the dogs. When Luthor, the massive Doberman, destroys a dog show and injures a champion dog, Savannah’s family faces a massive lawsuit and are forced to take him to the pound. Griffin Bing, also known as The Man With The Plan, and his friend Ben can’t let Luthor be left there—but the only way to keep the dog safe would be for him to win Best In Show at a national championship. Is it possible to do this before Luthor eats his competition? I haven’t read the other books in the series, but I knew I wanted to read Showoff as soon as I saw Gordon Korman was the author. Korman is one of the best writers for middle grade readers, constantly rolling out stories full of humor, adventure, and heart. The other books aren’t necessary in order to enjoy Showoff; the characters aren’t so well-developed that you miss anything. Griffin and his friends are likable—the kind of kids that readers will wish were in their gang. The fact that they have access to a collection of bizarre inventions and animals only makes them more interesting. The read star of the novel is Luthor, the silly smile he displays on the cover is only one of his many emotions. Readers will be coveting their own giant, prize-worthy Dobermans by the novel’s end. The true proof of Showoff’s appeal? I had the book on my desk and three students came up to ask if they could borrow it. My copy won’t even see the shelf for a few weeks…Korman’s that good. 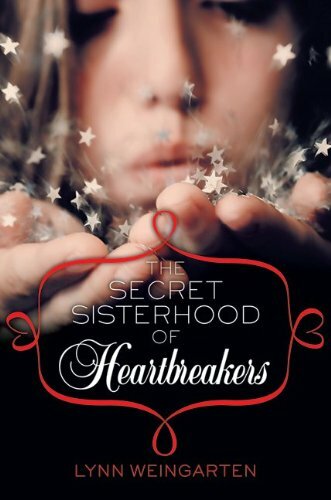 The Secret Sisterhood of Heartbreakers is the kind of novel that you pick up to read the first few pages, and then it’s suddenly 2:00 a.m. and you missed dinner. Proof: I received this in the mail yesterday afternoon and am already dying to share it with you. Lucy’s sophomore year does not begin as expected: she is unceremoniously dumped by her boyfriend, Alex, before homeroom. As she weeps over where things went wrong, three glamorous older girls reach out to her with a beguiling promise. If she does what they say, they will teach her the magical skills to never have her heart broken again and let her join the ancient sisterhood of the title. Of course, promises and magic often have strings attached and Lucy must decide if the sisterhood is worth the high price of joining. 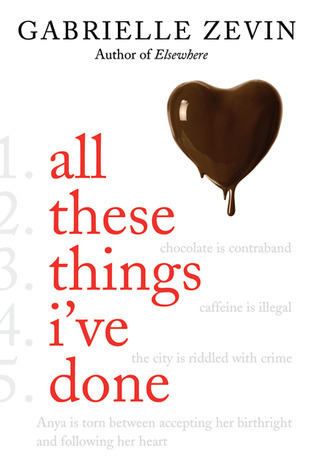 The absolute best thing about this novel is how deftly Lynn Weingarten describes heartbreak. Through a series of flashbacks, the reader learns that Alex was never really the right boy for Lucy, but she is so caught up in her infatuation that she can’t see it. In a particularly poignant scene, Lucy realizes she is jealous of everything that takes Alex’s attention away from her. Who hasn’t felt that way about someone that you like just a little bit more? Weingarten’s descriptions of Lucy’s sadness offer reassurances that other people feel similarly and that maybe some magic awaits on the other side of the misery. There is an underlying theme of confidence to the novel, and Weingarten provides subtle tips on how readers can approach their love lives with the upper hand. I wish that when I was a teenager there had been a novel that said things like, “Giving a guy an easy opening line is often the difference between him standing, staring, wishing he could talk to you and actually being able to do it.” While it’s never quite clear if the sisterhood is actually trustworthy, the advice they give is spot-on. I was frequently surprised by the twists in the novel, perhaps most of all by the ending. At times, I was reminded of “The Craft” and “Clueless”, which is definitely a good thing in my book. I was excited to learn that Weingarten is working on a sequel because I am eager to read more about what magic the future holds for Lucy. Happy Cybils Results Day, everyone! I was surprised and pleased to see the winning titles in the graphic novels category, in which I was a Round One Judge. If you haven't read Anya's Ghost or Zita the Spacegirl yet, check out my reviews by clicking on the titles. I think you'll enjoy them as much as I did. Looking at the list, I have a few new books to add to my reading list, especially Nerd Camp and Stupid Fast. Check out all the winners here. Happy reading! I'm currently slogging my way through A Feast for Crows, which is the slowest novel in the Game of Thrones series. 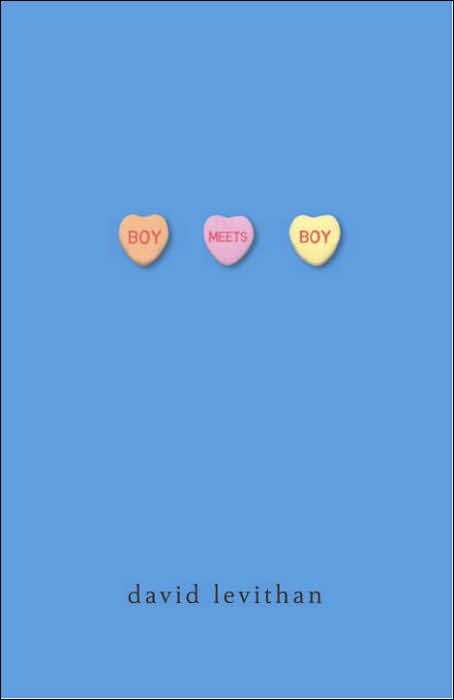 I decided to take a break and enjoy Boy Meets Boy, a beautiful confection by David Levithan. As the title suggests, the novel follows the classic romantic plot structure, this time with male characters. Levithan creates a world where sexual preferences are beside the point--it is a high school where a cross dressing football player can be the homecoming queen, the PFLAG group is as large as the PTA, and where any combination of sexes in a relationship is common. In this hopeful world, Paul has a great group of friends, a supportive family, and many opportunities. When he messes up his budding relationship with a new student, Paul must be creative to win him back. I will be leading a discussion on this book for members of my graduate school cohort. In my southern, rural university, the views on homosexuality run the gamut. As an entry point to the discussion, I've gathered very broad quotes and will give each person one to consider how it connects to the characters, our future students, and themselves. I hope this exercise highlights the similarities between all people and encourages a thoughtful, sensitive discussion. The Scorpio Races is a book as harsh and lonely as its setting, the fictional island of Thisby. Maggie Stiefvater sets a remarkable tone for the novel, so that the reader feels the November winds and the gnawing desires of the characters. There is a feeling of foreboding that hangs over The Scorpio Races, and strangely, I miss it now that it's gone. Every November the capaille uisce, mythical water horses, rise from the sea. They are thirsty for blood and difficult to control, so there is no better test of manhood than to harness them and race them down the beach. The prize is also the best way to earn money on Thisby. No one has won more races than Sean Kendrick, but this year, the stakes are higher. Likewise, Kate "Puck" Connolly is desperate to win, and as the first female to ever enter, the odds are stacked against her. I don't want to say anything more about the plot, because this is a novel that I insist everyone reads. Sean and Puck are probably two of my favorite characters in a long time. They are both prickly outcasts and slow to warm up to, but once they are in your heart, they sit there and burn. Stiefvater alternates between their perspectives and I both loved and hated the switches, because I wanted more of each of them. Unlike in other novels (ahem, Across the Universe), we don't get both of their perspectives on a situation, so when I wasn't reading, I was thinking about how Sean might have seen things. To use a title from another Stiefvater novel, this one lingers. Put down whatever you're doing and go get The Scorpio Races. Then call me so we can gush. One of my favorite bloggers, Katie of Book Love, recently posted about the School Library Journal's Battle of the Kids’ Books. I love the idea of pitting some of the best books of the year against each other, as well as getting to read authors’ justifications of the winners. I am currently reading Between Shades of Gray, and would like to read a few more of the novels before the competitions start on March 1st. 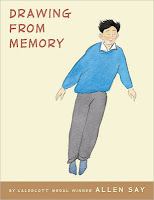 Drawing from Memory is a book that I read in consideration for the Cybils, but never reviewed. At first, it looks like a picture book, but it is so much more than that. This collection of photos, illustrations, sketches, and comics is Allen Say’s version of an autobiography, both heartwarming and informative. It is a unique graphic novel, full of things to learn. 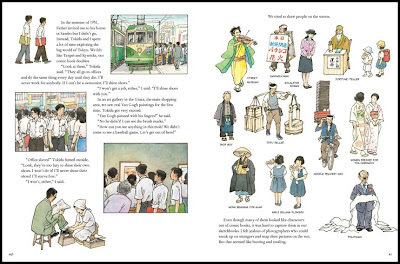 Say’s drawings give a great feeling for life in Tokyo in the 1950s. His drawings of people on the street show so much of the fashion and jobs that people held, in a far more interesting way than reading an article on the subject. My favorite part of the book detailed how Say moved into his own tiny apartment at age twelve to focus on his studies. 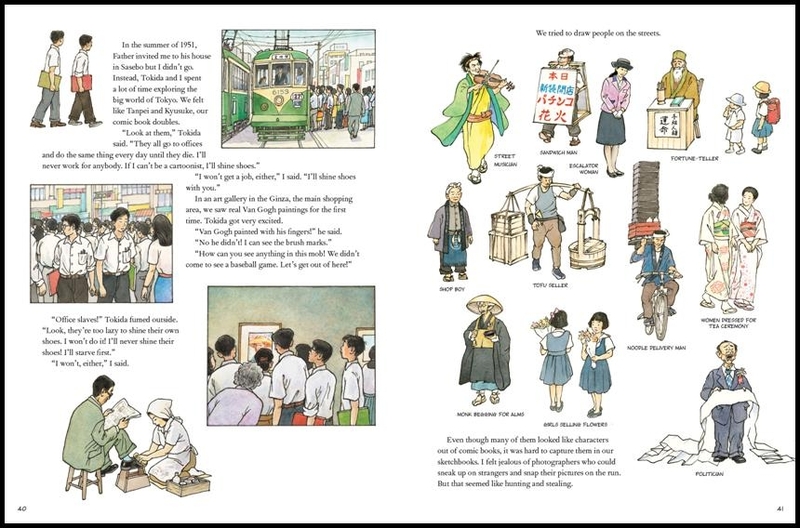 Having lived for a year in Japan, I loved following his adventures as a child living on his own in Tokyo. Say’s apartment looked very similar to mine (read: minuscule) and his daily activities mirrored many of mine. I smiled to see him sitting in a restaurant like I did and exploring the city with wide eyes. Drawing from Memory is not a typical graphic novel, and difficult to categorize. I think it would appeal most to young artists, who can pore over Say’s work to see how his art developed, and be inspired by how he finagled an internship with Japan's top cartoonist. The cover does it a disservice; almost any of the illustrations inside would be more likely to grab a young reader's interest. If I wanted one of my students to read it, I would hand it off, already opened to the first page. 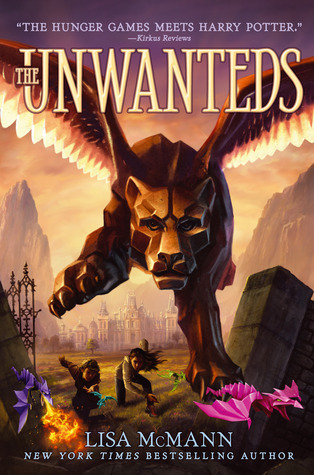 Read this and other reviews at Young Adult Books Central.